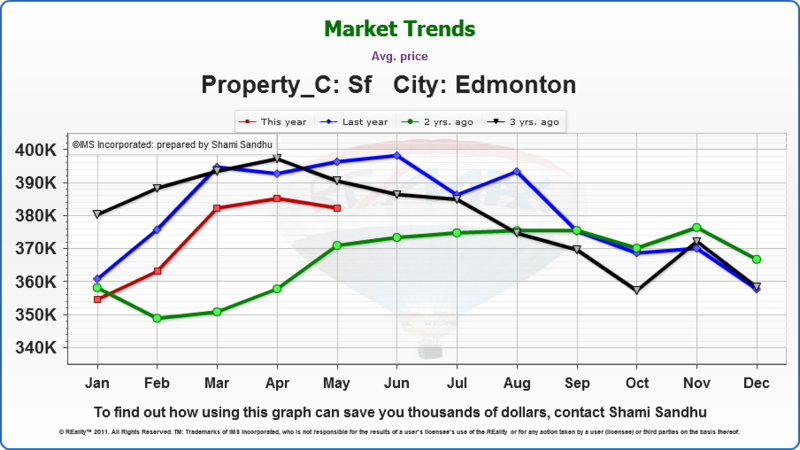 Edmonton’s market needs to see a list to sales ratio of 65%+ and average inventory below 6,000 to see consistent price increases. Our historical ‘boom time’ was based on consistently low supply (under 3000 on average), and high demand based on economic factors, low interest rates, and high consumer confidence. The groundwork is laid however, for this to begin over the next 1-2 years. That said, we are generally experiencing very normal market conditions currently and the past two years have had typical seasonal cycles on sales volume and prices. As you can see from the graphs below, prices always fall into the fall season. Averages shouldn’t deter buyers though, as finding the deal that is right for your situation can always be found at anytime in the market cycle. What should you do? Where are the opportunities? Now is a great time to buy. With plenty of choice, currently low interest rates that are planned to increase by fall, and more motivated sellers into the fall, if you are looking for your first home, moving up, or an investment property, now is the time! Seller’s looking to maximize their equity, should likely wait until Feb/Mar of 2012 to place their property on the market. Except if you are looking at moving up in price and home size, then now’s the time. August will be the absolute latest you’ll want to have your property on the market, so call us today! Edmonton, July 5, 2011: Economic and other external indicators point to a strengthening of the local real estate market according to the REALTORS® Association of Edmonton. Statistics Canada reported that Alberta boasted the highest spike in population in the first quarter with a 0.4% increase. The Conference Board of Canada predicts that housing prices in Edmonton will increase from five to seven percent in the short term although local prices are currently down when compared to last year. Although the Bank of Canada seems reluctant to raise interest rates because of the negative impact on exports, CMHC reports that Canadians are budgeting for an interest rate hike. 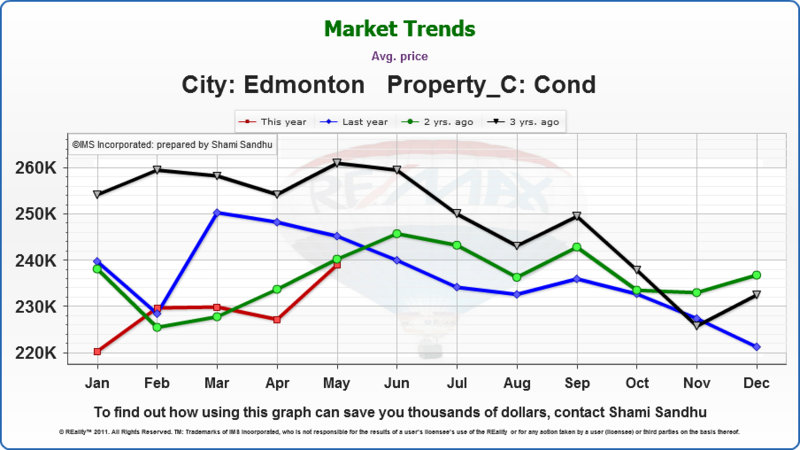 While housing prices nationally are up by 8.6% (May figures) Edmonton prices are tracking predictably in a stable market. CIBC is of the opinion that Alberta home prices are over-valued by 17% yet RBC names Edmonton amongst the most affordable major metro markets in Canada. A report by Peters and Co. forecast that $180 billion will be spent on new oilsands projects in the next decade with current oilsands operations and maintenance adding another $30 billion a year. In the first half of the year the average* price of a single family detached home has risen from $357,540 to $379,409 while the all-residential price has risen from $308,497 to $330,297. However compared to the same-month year-over-year, prices have risen consistently between the levels set in the past two years. In the short term, when compared to the previous month, prices in June were generally stable. Single family homes were up 0.31% from $378,239 to $379,409. Condo prices dropped from $239,782 to $231,852 (down 3.3% after rising 3.1% in May). Duplex and row house prices climbed slightly from $295,334 to $296,689. The all-residential average price dipped 0.5% during the month of June. There were 1,768 residential sales in June with 3,260 listings resulting in a sales-to-listing ratio of 54%. This is compared to 53% in May. There are currently 8,432 residential properties in the MLS® System inventory and days-on-market is slower at 53 days (up from 50 in May).